ABUJA, Nov 11 2016 (IPS) - The Nigerian military announced the rescue of a missing Chibok schoolgirl Saturday, bringing to 23 the number freed since Boko Haram seized 219 girls from a secondary school in the country’s northeast in April 2014. The latest rescue came about a month after the Islamist group released 21 girls in a deal with the government. Earlier in May, Amina Ali became the first amongst the missing girls to be rescued. 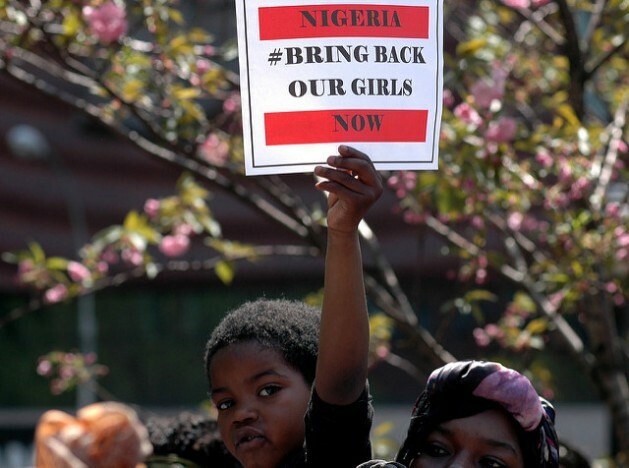 Boko Haram has also abducted hundreds of men, women and children. But the abduction of the Chibok girls drew international attention, galvanized with the Twitter hashtag #BringBackOurGirls. The releases riveted people around the world, and the government has flaunted them as political coups. But they have also rekindled demands from activists campaigning for greater government action for the release of nearly 200 girls still in captivity. “It’s day 933 of abduction; 197 girls (are) still in captivity under your watch Mr. President @MBuhari. Time to bring them home,” Maureen Kabrik, a member of the BringBackOurGirls group, tweeted to President Muhammadu Buhari days after 21 of the girls were released early October. The BringBackOurGirls group, set up to publicise the plight of the girls amidst international outrage in 2014, announced it would release on November 14 a report of a six-week monitoring of the government’s effort to rescue the girls. The group accuses President Muhammadu Buhari of not doing enough to rescue the girls despite his electoral promise a year ago. Alongside other campaigners, the group has held protest marches in the capital Abuja for months. Between August and September, it staged 78-hourly marches on the presidential villa and threatened to increase the pace to 48-hours in November. Now, it is promising to do even more to press for the girls’ release. “Our obligation to demand (the) rescue of the rest 197 of our Chibok Girls is ever stronger,” said former Education Minister and World Bank executive Oby Ezekwesili, who co-founded the group. Boko Haram, which has waged a seven-year insurgency aimed at carving out an Islamic caliphate in the northeast, seized more than 276 girls from their school in April 2014. The group opposes Western education and has killed over 20,000 people, among them teachers. In September, U.S.-based 21st Century Wilberforce Initiative and the Stefanus Foundation said in a report that 611 teachers died as a result of the crisis since 2009. The report said 19,000 teachers had been displaced, 1,500 schools closed down, and 950,000 children denied the opportunity of accessing education. President Buhari campaigned on the promise of fighting corruption, defeating Boko Haram and rescuing the Chibok girls. But rights campaigners have long criticised the administration’s pace at getting the girls home. In September, under pressure from activists, the government released details of its attempt to swap the girls with Boko Haram fighters. Information Minister Lai Mohammed said talks began barely two months after President Buhari took office in May 2015. He said the swap deal failed to go through at the last hour even after Buhari assented to the “difficult decision” of freeing the militants. The president believed that “the overall release of these girls remains paramount and sacrosanct,” Mohammed said. An attempt to restart the process in December 2015 also failed, in part due to a leadership crisis in Boko Haram’s ranks. After 21 girls were released in October in a deal brokered by the Red Cross and the Swiss government, the Nigerian government assured that some 83 more would be freed “soon”. Presidential spokesperson Garba Shehu said talks had reached an advanced stage. But as weeks passed by with the girls still in captivity, the demands have intensified, and the initial euphoria has gradually given way to disenchantment. The BringBackOurGirls group said while there has been some improvement, the government still must do more to rescue all the girls. Daily, the group circulates on social media figures reminding the government how long the girls have been in captivity, and how long they have been held under the Buhari presidency. “Day 939 of #ChibokGirls‘ abduction. 196 still in captivity. Day 529 under President Muhammadu Buhari’s watch,” it posted on Twitter on Nov. 7. The government says it is not relenting. “Whatever it takes to get the Boko Haram situation under control, we will do it because there are still more girls in captivity,” Information Minister Mohammed said last week. Experts warn that the girls face stigmatisation following their ordeal at the hands of Boko Haram. “Frequently, returning to their families and communities is the beginning of a new ordeal for the girls, as the sexual violence they have suffered often results in stigmatization,” said a statement by the UN children’s agency UNICEF. But the presidency denied the girls had been abused or raped during their during two-and-a-half years’ captivity. On Wednesday, Thompson Reuters Foundation quoted a confidential report prepared based on interviews with the girls as saying that while they were all encouraged to marry the militants, they were neither forced into doing so or converting to Islam. Reuters Foundation reported that 61 had married Boko Haram militants, while those of them who did not agree to marry were used as servants. Security analysts have also warned about the possibility of the girls being indoctrinated.